than a sliver of a dead child’s laugh. for salvation or the Superbowl. They may have been her hands. but my body by a man’s, and bone-dry. Most poignantly, Kindred reads and rereads Peter Pan and Wendy as a narrative of the frayed but essential bond between mother and child—the endless push-pull (for both) between the need for safety and the desire for freedom and adventure, in a world that wavers between fantasy and nightmare. Nashay Jones’s richly-colored illustration for Darling Hands, Darling Tongue’s cover shows a mother stretching her arms upward toward a child who may be either returning to her or flying away, as petals—or wings—fall around them. to land and adopt the Lost Boys. their wild breath at the glass. Fabulous review, Angele. I'm really excited to get this chapbook. 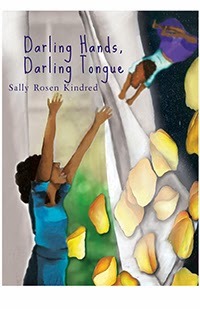 I love Sally's poetry and her retelling sounds dark and unsettling. And Kudos to that cover - I love Nashay!